Once thought to be the longest river in Jamaica but has more recently lost that title to the Rio Minho, the Black River, originates in the mountains of Manchester and flows west where it disappears underground and re-emerges in St Elizabeth. Measuring 53.4 kilometres (33 miles), it is navigable for about 40 kilometres (25 miles), and is supported by many tributaries including Y.S., Broad, Grass and Horse Savannah. The river was the main transportation route for the parish, as the route travelled through the dense and humid mangrove swamps. The river get's its name from the darkness of the river bed that has over the years been lined with thick layers of decomposing vegetaion. This gives the river a dark almost black hue especially in the more thickly vegetated areas. The Black river begins as an underground stream in the Cockpit Country and emerges north of Siloah on the southern border of the Cockpits. At Maggotty, the river runs alongside the road where it is convenient to explore its banks and to view the many small waterfalls and the Black River Gorge. The vegetation is dense and overgrown in places but the Apple Valley Park maintains a cleared trail to the gorge and will also provide a guide. To the south of Maggotty past Newton, the river flows into the Upper Morass where the waters merge with those of the Smith River and other smaller tributaries. It is dominated by thick rushes and is easily explored by canoe. 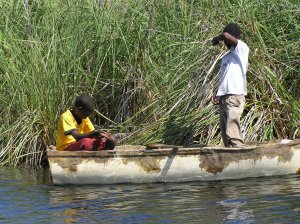 Sugar cane is grown on the land to the north of the Upper Morass where the fertilizer and pesticide run off has polluted the river. 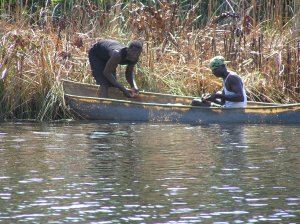 In the Elim area, a variety of African perch known locally as the "Jesus fish" is being farmed to help combat the overfishing of Jamaica's coastal waters. Its local name refers to the miracle of the multiplication of fishes because it is a prolific breeder. Also found in these swamps is the "Jesus bird", the northern jacana that wades among the floating leaves of aquatic plants giving the impression of walking on water. Jamaican colloquialism is uniquely descriptive and frequently imbued with biblical references. The river flows to the plain known as the Savannah, through the Great Morass and to the sea at Black River, the capital of the parish. 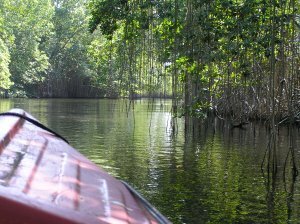 After passing through Lacovia, the river flows into the Lower Morass, the largest (14,085 acres) swamp environment exhibiting the greatest biodiversity in the entire Caribbean. The river merges with the waters of the YS River near Middle Quarters, an area well known for its crayfish that is sold at roadside stands as "hot pepper shrimps". It is in this region of the Lower Morass that "shrimp" fishermen can be found tending their trap baskets that are similar in design to those still used by fishermen on the Niger River in Africa and brought to the island by slaves over 300 years ago. Upriver, the YS Falls are a delightful contrast to the somnolence of the Lower Black River. The cool, clear water rushes over three levels for 120 feet to form one of the largest and prettiest waterfalls in Jamaica. Large pools at each level allow for a refreshing swim and are accessed by stairs alongside the river.